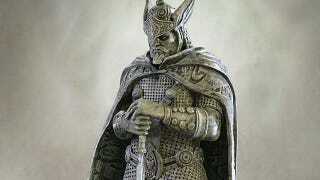 Gaming Heads will next year be releasing a replica of the Shrine of Talos, giant statues found in the Elder Scrolls games. These aren't tiny little desktop ornaments; they stand around a foot tall, or 14 inches. Only 1100 will be made across two versions ($180 for a standard, $200 for collector's), with each detailed and painted by hand. Note: will not cure disease or reduce your cool-down time.